“U.S. Troops prepare for Rhode Island service following the request of Governor Theodore F. Green of Rhode Island for federal troops to aid in controlling the textile strike situation in that state, these soldiers at Governor’s Island N.Y., are shown as they packed their kits to be ready at a moments notice. 9/13/1934”. Rhode Island experienced a series of violent strikes and riots in September 1934 after a long term decline in the textile industry. The strikes caused the national guard to be deployed in riot control and almost reached a point where Federal troops were close to being called out to support them. As the strikes began on the 3rd of September, they increased in violence and spread across the State over the coming days. After the riots spilled into the New York City’s business district and several people were killed in the looting, the national guard was called out into the city to support the local law enforcement in riot control. The escalating situation caused the Governor, Theodore F. Green, to urge Franklin Roosevelt to deploy Federal troops to quell the situation before it could be provoked further. However, as the troops prepared to be deployed, the riots ended suddenly on September 13th. Ten days later, after President Roosevelt appointed a national fact-finding commission to recommend solutions to the textile workers’ grievances, the United Textile Workers union called off the strike in Rhode Island and throughout the nation, ending the violence. 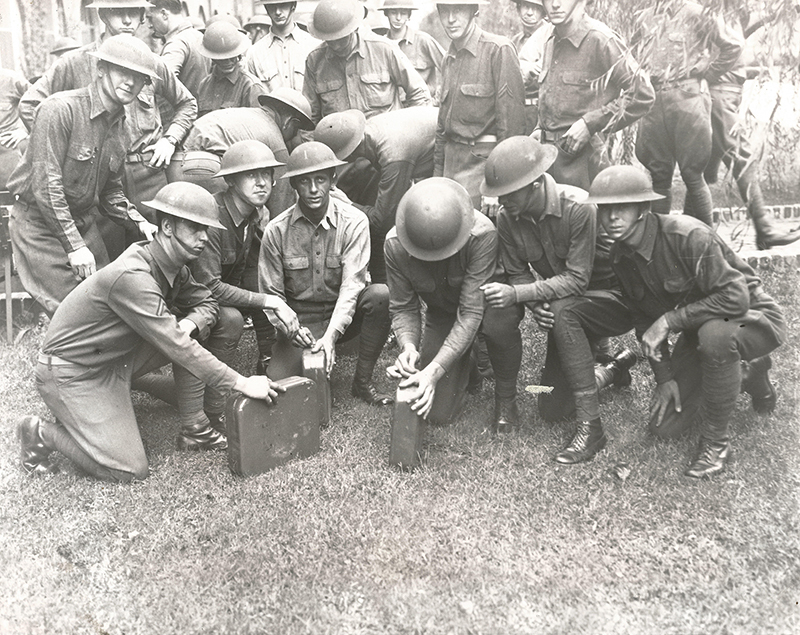 These men of the 16th Infantry Regiment are packing away their equipment following the abrupt end of the riots and pose for a photographer before returning to barracks. The men all have the ‘Big Red One,’ the iconic insignia of the 1st Infantry Division, painted on their M1917 ‘Kelly’ helmets.